I had an exhausting afternoon! ; ) I went at 3:30 with my mom to help her go pick up her car at the mechanics. I was feeling pretty good this afternoon when I took her and for the first time was happy to get out and about. She needed to go get a tire put on as well so she decided we'd go to walmart and get it done there and that way we could look around while we waited. Well we went through the toys with Zebedia and were still waiting for the car so mom says what the heck let's just go see if they have anything good to look at in the baby section. We were not really impressed with much but it gave us something to do and it was the first time we've been anywhere together to look at baby stuff. We get done and decide to go check and see if the car is ready. 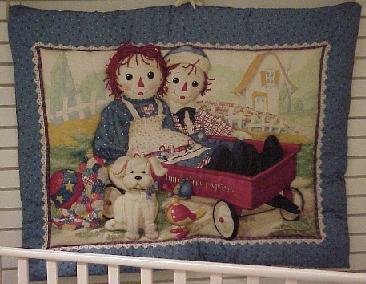 And then, there sitting out away from the other baby stuff, is a Raggedy Ann and Andy crib and baby set! 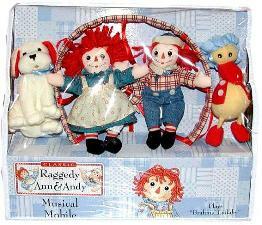 I love Raggedy Ann and Andy (always have since I was a little girl). I couldn't believe they had one I had been looking at there! Well we couldn't find a price but online they run anywhere from around 95 to 199 dollars for a 3 piece crib set. 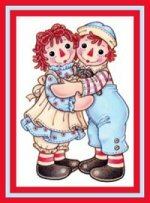 So we got the 4, yes 4, piece crib set (we co-sleep but I still love doing up the crib and all hehe) and we also got the musical mobile, a layette set and a fleece blanket all in the Raggedy Ann and Andy theme. They also had a little lamp and a diaper stacker but we THOUGHT that would add probably another 80 dollars or more to what we already had so we didn't get those. I about fainted when I found out how much all of that we got came too....now mind you this exact set is selling else where just for a 3 piece crib set ranging from 95 to 199 dollars.....our grand total was 86 dollars!!!!! I could not believe that!!! What a steal! The crib set, mobile, layette and fleece blanket all came to just 86 dollars! It's the exact same set and brand as the others but apparently just oodles cheaper! I am so happy I had an afternoon and evening to half way enjoy myself though before getting so sick again. I feel just awful now. The nausea is just building up and this horrid head ache isn't helping so it's going to be a lovely night I can tell.